Old & atmospheric. A few interesting & well kept beers. Very old pub admittedly, the positives end there i am sorry to say. Dark and dismal, the pint of Bank Top bitter i drank being nothing better than average. For such an historic building, things could be so much better. 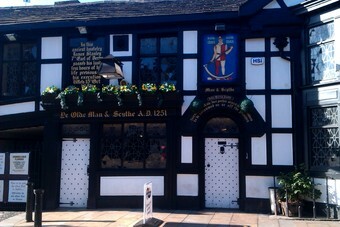 Bolton is a real desert of a town for good pubs, don't know why! Closed down by pub chain Enterprise Inns last Monday October 15. All staff told by text that they're redundant by text. Enterprise Inns to reopen with new staff. I would agree with you on the historical connections Paul154, but they dont even seem to bother with this since the sad loss of the Landlord, John Jewitt. Very expensive for Bolton(�3.50 for Guinness), and they have now stopped doing food at lunchtime. Seems to trade a bit on its historical connections. I had a couple of pints of so-so Holts bitter, although one of my friends was raving about the Thatchers cider (while sensibly limiting herself to a couple of halves). A bit expensive compared to other pubs in town.